Israeli soldiers have wounded a young Palestinian man whose photo has become recognised worldwide as a symbol of Palestinian resistance. 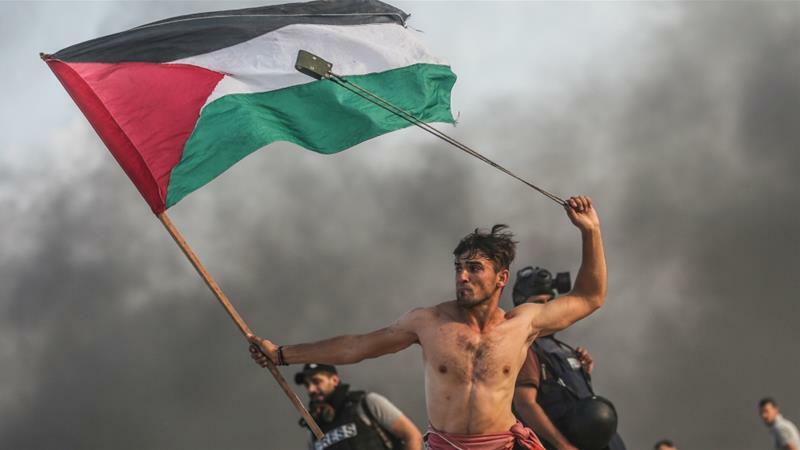 With a Palestinian flag in one hand and a slingshot poised in the other, the photo of 22-year-old A’ed Abu Amro has drawn comparisons with the iconic French Revolution painting, Liberty Leading the People. Abu Amro was taking part in protests at the northern Gaza border against Israel’s 11-year-old land, air and sea blockade when Israeli troops intervened. Abu Amro was wounded in the leg by live bullets during the clashes. “If I get killed, I want to be wrapped in the same flag. We are demanding our right of return, and protesting for our dignity and the dignity of our future generation,” Abu Amro told Al Jazeera late last month. The photo, which went viral on social media and attracted worldwide attention, was taken by Anadolu Agency photojournalist Mustafa Hassona during a demonstration demanding the lifting of Israel’s blockade of the Gaza Strip. “I don’t go to protests to get pictures of me taken, but this has encouraged me to continue demonstrating,” he earlier told Al Jazeera. They are also demanding an end to Israel’s crippling blockade of the Gaza Strip, which has gutted the coastal enclave’s economy and deprived its two million inhabitants of many basic commodities. Since the Great March of Return demonstrations began on March 30, more than 200 Palestinians have been killed and thousands more injured by Israeli troops deployed along the other side of the fence.